She was found many months ago in Northern California, young and pregnant. And homeless. She wandered onto a dairy farm, looking for help, looking for safety. They did not want her, but to their credit they took her to a rescue shelter instead of the pound or worse. Drowning in unwanted souls, the lady who headed up the rescue was desperate to help. She made some phone calls. One of those calls was to a rescue organization two states away in a small town – our small town. By this time Haley, a two year old black lab mix, had given birth to four little pups. She was loaded onto a transport truck along with her babies and who knows how many other scared and tired dogs and they traveled and traveled and traveled. A week ago Friday, Husband was getting ready to knock off at work. He needed to run across town to Costco to pick up a few things (who am I kidding, we never go to Costco to pick up a few things). Before he left for the day he decided to see if there happened to be a dog rescue in our town. Since the death of our last sweet, elderly dog Dexter in February, we have talked off and on about getting another dog. We have not actively seeked out, only talked about. Well, Husband discovered that, yes indeed, we do have a dog rescue in our town. He looked at pictures of the dogs they current were trying to place in their forever homes and there was Haley. Her brown soulful eyes, eyes with a sadness and a timelessness about them, looked out from the computer at him. Long story short, for my coffee cup is empty and the children are beginning to stir – yesterday a couple of ladies from the rescue organization came to our house to do the home inspection and fill out paperwork. Today Haley comes home. Today Haley has found her forever home. One last thing – I have to give a shout out to the writer behind the blog Motherhood is an Art and her post on how much her daughter wants a dog, which I commented on just one day before Husband found Haley. She asked for a show of hands on whether or not they should get a dog. I blame you for putting this idea out in the universe. Thank you. This entry was posted in Furry Feet (and fish) and tagged Dogs, Family, Forever Home, Pet adoption, Pets, Rescues and Shelters. Bookmark the permalink. 12 Responses to Rescue Me! Thanks – we are very much head over heels for that sweet pup. Welcome Haley!! What a beautiful face..I’m so glad you all have found each other! I really thought the timing was bad for bringing a dog into our lives and then I looked into her eyes and realized that the timing couldn’t be more perfect. Congrats on the new addition to your family – Haley is one very lucky dog! Thank you! We are one very lucky family to have Haley in our lives. This is the dog Cody and Carter will remember growing up with – it is blowing my mind a little bit. That is too awesome! 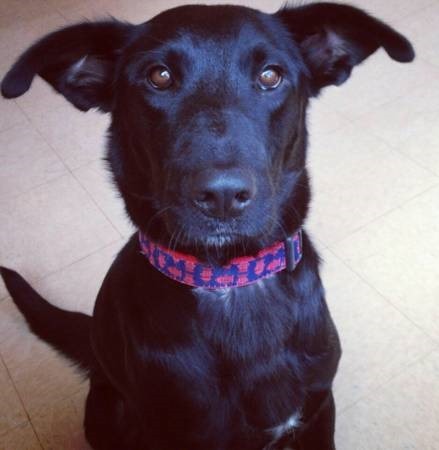 Haley looks like a perfect companion for your family! I don’t feel sorry at all for putting this out in the universe! I can only imagine this is going to be a wonderful decision for your family. You are not going to believe this but just yesterday we went to our animal rescue shelter. Iris wanted to donate some money to them. We looked at all the dogs and one really tugged at my heart. I brought it up to my husband last night and he was all ready to go get him. I am still not convinced I am ready yet but I know that the image of that dog is going to keep running through my mind! Hahahaha – see what happens when you blog things – they become a reality. I was not convinced when Husband called me up on the phone to tell me about this sweet black lab he had visited but once his car tires were crunching the gravel on our driveway, I quickly got shoes on the boys and we were out the door to go see her. A week later, and she is now home with us. 🙂 You will find your four-legged furry friend when the time is right. Haley looks so sweet!! Our dog is also a rescue dog – from a litter of puppies that were saved from the animal shelter. She is truly the best dog ever – it’s like they know and they are grateful! We have never had an actual rescue dog, ours were strays or from the humane society. She has been through a lot and is not ready to fully trust us but is getting more comfortable by the minute. The main problem is our cats who hiss at her and carry on. This gets Haley excited and wanting to chase them. Wow, you just made my day. I’m crying happy tears here, what a great story! Best of luck with Haley and please keep us posted on her progress. Congratulations!! It is a great story! I am so happy Haley and our lives crosses in that exact moment that it did and we were able to give her the forever home she deserves. Cody and Carter are so excited to have a dog again. Haley is gentle and kind, sweet and loving. She has the desire to chase the cats but is trying really hard to ignore that desire. Our one stumbling block, which we will work through, is her severe separation anxiety. Poor girl – I can’t blame her. Glad I could make your day Jodi!